I have seen authentic recipes which use either Trenette and Trofie. I prefer Trofie – Barilla make a very good Trofie. But any shape of pasta works well with pesto. Use long shapes such as spaghetti or tagliatelle, or short shapes such as penne or fussili. Most people will find chomping into a clove of raw garlic unpleasant. But taking that same clove and mashing it up with some basil will do little to reduce or dilute the astringency. What’s more, this astringency and taste can linger, making the sufferer – and those people nearby – uncomfortable. Furthermore, it seems for those sensitive to this astringency the effects are pervasive, irrespective of the quantity of garlic used. The following notes address this issue. Pesto is a raw garlic sauce. It’s pleasure is in balancing the astringency of raw garlic with the creaminess of pine nuts, the herbal freshness of basil, the roundness of a well balanced olive oil and the butteryness of an aged Parmesan. The overall flavour is rich, fresh, floral and herbal – with an accent of garlic. I have a note below about how to eliminate astringency through microwaving and poaching the garlic – but the pesto loses something. It should therefore be accepted that pesto will taste of garlic. But it should not dominate, nor overpower. The solution is not to use too much garlic. If in doubt, start with half a clove and add more if necessary. It’s worth tasting your raw garlic types to compare astringency, especially the aftertaste and how long it lingers and if it mellows. This is a tough ask and brutal on the taste buds, but mash some garlic up and put it on a bit of bread and taste. You’ll be surprised at the differences. Choose your mildest garlic. See my article here on the comparison of four types of garlic. The ‘official’ recipe for pesto requires the use of Vessalico garlic from Liguria. It is grown in a very small area and production cannot keep up with demand, which must explain why I cannot find it in the UK. Apparently, it has been described by the BBC as better than viagra, whilst other commentators refer to it as the Rolls Royce of garlic. It is described as having a delicate aroma with an intense and piquant flavour. The piquancy reference will be common to all garlic – it’s the hot bite on the middle of the tongue – a heat that is similar to eating a chilli but accompanied by an intense tang of concentrated onion. It is said to be easy to digest. Well, if any garlic can claim to be easy on the digestion when eaten raw – then it surely would be the rarest of commodities. But I believe, the difference in a blind tasting would be subtle. If you can’t get hold of Vassalico garlic and do not want to take my ‘garlic test’, then just use your normal garlic. Don’t add freshly made pesto to a cold or tepid plate of pasta. 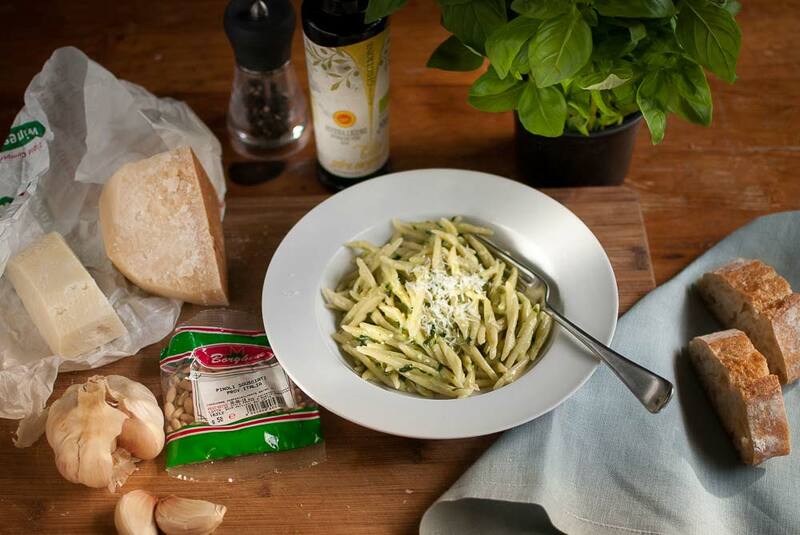 Make sure everything is piping hot and then add the pesto – loosen with very hot pasta cooking water. Keep serving plates and bowls hot as well. This important part of the recipe will help the flavours of basil, garlic and cheese to heat sufficiently to meld into a less astringent sauce. If a clove of garlic is put in the microwave for 30 seconds, it will still be hard and crunchy, but it will have lost all its astringency. Unfortunately it also loses much of its garlic taste. This idea works better when the garlic is poached in milk for two to two and a half minutes. Most of the astringency is lost, but much of the flavour of garlic is retained. I have made pesto with poached garlic. It’s not the same, but still a good pesto. Make it this way when it is used as a puree or sauce for amuse bouches, tarts, or adding to soup as a pistou – or for cold pasta salads. Finally, the astringency of basil mellows with time. Make the pesto the day before, keeping the pesto in the coldest part of the fridge. It will keep well for 2 – 3 days. Much of the pungency of a powerful pesto can also be attributed to the basil as much as the garlic. Some basil is harsher than others. Genovese basil is imported by Natoora and bunches can be bought at a price. The basil comes with a European Union PDO certificate (Protected Designation of Origin). This guarantees a high-quality taste and flavor. I have used this basil and it is excellent quality. It has a depth of flavour yet tastes fresh and fragrant without any of the bitterness or astringency of older bigger-leaved types on the market. However, it is possible to buy basil growing in pots in the supermarket and these are a very good alternative. They also taste fresh and fragrant without bitterness and despite lacking the depth of flavour of Genovese basil, these pots make a very accessible and flavourful pesto. There are many reports of pine nuts having a metallic aftertaste, worse still the reports say other food eaten after the pine nuts become tainted with a metallic taste. The condition even has a name: pine nut syndrome. It has also been reported that the cause may be due to the chemical treatment of the pine nuts. I will leave you to do your own further research on this and to come to your own conclusions. However, not all pine nuts are the same, examine those from China, America, Iran and Italy and they all have different shapes tastes. I have sourced genuine natural and unprocessed Italian nuts online. They are not only a thing of beauty (long with elegantly tapering ends), but they taste exquisite (for a pine nut). They are mellow, sweet, not too nutty but with lovely smooth and creamy texture – perfect for pesto. Ligurian olive oil is more golden and less green in color than Tuscan oil. It has sweet almond or even marzipan notes, a sap-like freshness, and a woody warmth. It’s quite mild. This makes it ideal for pesto. If getting hold of some Ligurian olive oil proves difficult, substitute a milder olive oil so that it does not dominate the pesto. The pesto should be about the flavour of the basil, nuts and cheese, so leave your flavourful expensive virgin oils for drizzling on other foods. Recipes call for a mix of Parmesan Reggiano and Pecorino Sardo. A well-known London Italian delicatessen says that the correct partner for Parmesan is Pecorino Romano – a hard white salty cheese. However, this deli’s Romano is actually far better than others I have tasted. I quite like the way it helps to season the pesto. An aged Sardo tastes like manchego, a little milder than a Romano and not as salty, both work well in combination with Parmesan. Pesto is essentially a paste of basil, garlic, nuts, cheese and oil. Many recipes spin-out variations in search of a distinctive recipe. Herbs other than basil are substituted or partly mixed, such as, parsley, carrot tops, rocket and mint. Pine nuts are mixed or substituted with walnuts, hazelnuts, peanuts, or pistachio. I have tried using half and half basil to parsley and swapped the pine nuts for walnuts – it’s not pesto but it’s very good. Use a pestle and mortar or a mini processor. If you use a processor, pulse gently to retain some texture. Make the pesto before boiling the pasta. Keep all your plates and serving dishes/bowls very warm. Pound the garlic with a pinch of salt, then add the pine nuts and continue to pound until creamy and smooth. Add the basil and pound until smooth, add the cheeses and continue to pound. Add the oil and continue to pound until well mixed, blended and smooth. Season with pepper. Boil the pasta according to instructions. Drain the pasta reserving some of the cooking water. Put the pasta back in the pan and add a couple large spoons of pesto. Mix, adding a good glug of hot cooking water. Serve with greens or salad with some crusty bread.